The image seen here is one of many graphic photographs that circulated during the Boston bombings. This week we were asked to discuss the ethical implications of such images. Let’s take a look at some of the repercussions of posting this content in the middle of a tragedy. As you can see, the victim who lost his leg in the blast is seen without any effort to blur his face. This is potentially problematic considering that his loved ones might have lost contact with him after the explosion, and “many used social media to connect with friends and loved ones, also sparing the overloaded cell phone towers in the region.” This image could have been the way they learned of his injuries. Even worse, he could have died from his injuries and they watched it play out from their smartphone. If the victim survived, which I hope he did, this photo would be another reminder of how bad it was and it could force him and loved ones to relive that day. Many people seek therapy after tragic events. Stumbling across this image could be a major setback for him, or anyone else who was there. However, one form of therapy for people suffering Post Traumatic Stress Disorder (PTSD) is Prolonged Exposure Therapy, which forces the individual to face their fears related to the traumatic event. Use of this photo might help the victim if he is seeking help for PTSD. Terrorists post images and videos from afar to show the world what they are capable of. Our media does their job for them on our own soil. News organizations post images and videos for all to see and essentially credit the terrorists with the damage. Without terrorists even addressing it, this content can cause terror in citizens and scare them into changing their daily routines. The media aims to be the main source of information but whether they like it or not, there is some form of propaganda spewing from each graphic image. Great post, Erin. I thought you did a really nice job of breaking down the ethical implications. The one that I agreed with the most was your point about first sight. What if this was how his friends and family found out what had happened to him? That would have been horrifying. Cell reception was cut in the city of Boston after the bombing so they may have not even known if he survive for not, and by the look of that image, it didn’t look good. I also agree with the point about it being traumatizing. For the rest of his life, that image will be associated with the bombings and it will be all over the internet. Imagine his child finding that on the internet? The man in the photo is named Jeff. He is now married with a baby girl! I am so happy to see him doing well after such a traumatizing event. He and the man with the cowboy hat are well known around the city. He is looked upon as a hero! I am so happy Jeff is doing well and honored as a hero. It’s amazing how many people have come together to build each other up and grow strong from the horrible tragedy. I looked him up on Facebook and he wrote a book called Stronger. He really seems like an inspiration, and not just to the people of Boston. His story could have been very different. Not everyone comes out stronger on the other end of something like this. We really have to be sensitive to everyone involved. That’s why it’s such a delicate balance with the photos we share. Thank you for your comment! I loved the way you structured your blog post. It makes it easy to get an idea of what you thought all of the ethical implications of this graphic image were. You brought up an interesting point about possibly posting the image but blurring his face to protect his family members and close friends who may not have heard about what had happened to him. 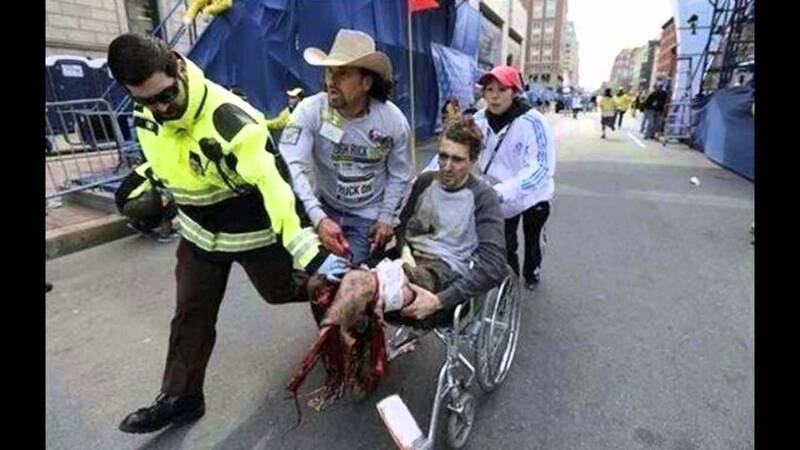 In fact, seeing this image circulate on Facebook was exactly how his family and friends found out that he had lost his legs during the bombings. To me, that’s not only insensitive, it’s unethical. I can only imagine having to find out about your son’s horrific injury via a third-party source. I think every effort should have been made to contact his immediate family before posting anything like this for the world to see and do think that it would’ve been beneficial to have blurred his face. As I was doing some research for this assignment, I came across an interview Jeff Bauman, Jr. (the man in the picture) did a year after the bombings. He said that at first, he couldn’t stand the fact that when you Googled him name, you’d see the photograph from that day pop up. But later, he said he understood why the journalist did what he did. It was his job to document the event as it happened. That being said, a graphic image such as this one could have long-standing effects on the victim who is simply trying to recover, both physically and emotionally, from this day. Lynette, I just don’t understand why blurring faces for this type if thing isn’t standard! Even though Jeff understood that the journalist was documenting the event it doesn’t mean it’s a free-for-all. I feel bad that he has this photo forever attached to his name. I didn’t realize this was how his family found out about it. How awful! Just think about that for a second. Imagine being in that situation and praying you don’t see anything come across social media but checking just to be sure. What if you saw this image of your brother, father, uncle or husband? Now that you know he’s severely injured, how do you find him? How do you find out if he survived? How much panic would that image cause? You might be on to something when you say images like this are unintentional propaganda for terrorists around the world. But, you can also rebuttal their propaganda with the image of suspect two with a sniper crosshair on his forehead. Sure, you can use the image from Boston as a recruiting tactic, but be aware that America doesn’t stand for threats and violence against its citizens. I agree with you that images like these will have a deep effect on the person and their families. I like how Lynette points out that it did have a long-lasting effect on Baumon because it shows the perspective of the person in the image. But, what is your stance on showing an image that is not graphic, but shows the emotions of someone right after a tragedy? For example, what if they showed a victim’s love ones crying at the finish line. There isn’t any graphic content in the image, but it shows the raw human emotions and people at their most vulnerable times. I believe there’s some ethical and moral questions raised in those types of photos. Mike, excellent point about raw emotions. I think people should be allowed to grieve in private. I just saw an article the other day showing a picture of a doctor who was crouched behind a wall grieving the loss of one of his patients. I couldn’t help but feel that the image was an invasion of privacy. This would be true for anyone dealing with tragedy. I think if the journalist put themselves in the griever’s shoes, they might not share the picture. Whatever happened to painting the picture with our words?